Princess Cruises recently announced a new series of exquisite chocolate offerings within the “Chocolate Journeys” experience and saying as almost everyone loves chocolate, I thought it only right that we share the news. In partnership with internationally acclaimed master chocolatier and pastry designer Chef Norman Love, the new chocolate offerings will allow you to indulge in even more deliciously rich experiences, including custom-crafted signature desserts in new venues throughout the ship, chocolate pairings with tea and more. I guess now would be a good time to remind everyone to pack their fat pants! I admit that I pack mine on every cruise, but as the years go on they are slowly becoming more “fitted” than “fat” – I have a problem. 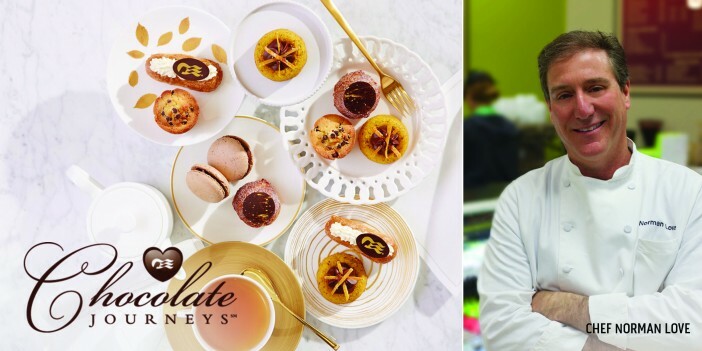 Trained in France, and the former executive pastry chef of Ritz-Carlton, Chef Love’s creations blend premium quality chocolate, unique flavours and artful designs, applauded by all chocolate lovers. International Café Treats – Each day in the International Café, a chocolate treat designed by Chef Love will be featured, from milk chocolate mousse, caramel and chocolate flan to peanut butter chocolate tarts and milk chocolate Chantilly éclairs. Horizon Court Breakfast Items – Throughout the voyage, savoury breakfast items featuring touches of premium chocolate will be offered, such as chocolate muffins, Bretons, puff pastry and Danishes. Horizon Court Evening Treats – Each evening, a delicious new chocolate cake will be served so you can sample a new and delicious flavour each night. Afternoon Tea – You will be treated to scrumptious chocolate bites designed by Chef Love, paired with a selection of flavourful teas and other traditional afternoon tea fare. Chocolate Soufflé – Available on select evenings during the voyage, the main dining room dessert menu will feature a new signature Chocolate Soufflé, developed in partnership with Chef Love. Chocolate Cookie – Chef Love unveils his unique recipes for delicious premium Chocolate Journeys cookies, found in select locations around the cruise ship, including the International Café and Movies Under the Stars. Not all of these delicious experiences are included in the cost of your cruise fare, some do incur an additional charge, but I am sure it will be worth every single penny. It’s chocolate, it’s worth its weight in gold! I made the mistake of falling onto Norman Love’s website earlier. The chocolates look amazing, so if you are cruising with Princess anytime in the near future and indulge in the Chocolate Journey’s programme then you are in for a real treat and I am very, very jealous! Just to get you in the mood, these are just some of the delicacies you can find on Chef Love’s website: roasted almond truffle, hazelnut praline truffle, cherry cordial truffle, dark chocolate cream truffle, Tahitian caramel, carrot cake, peanut butter banana, strawberry cheesecake, white chocolate raspberry and vanilla cupcake. Image sourced via Flickr Creative Commons. Credit: Nicole Yeary. Hero image used with permission and copyrighted to Danielle Fear.